Would you like some extra cash in your pocket? If so, you should sign up to be an umpire with Nashua Cal Ripken Baseball! 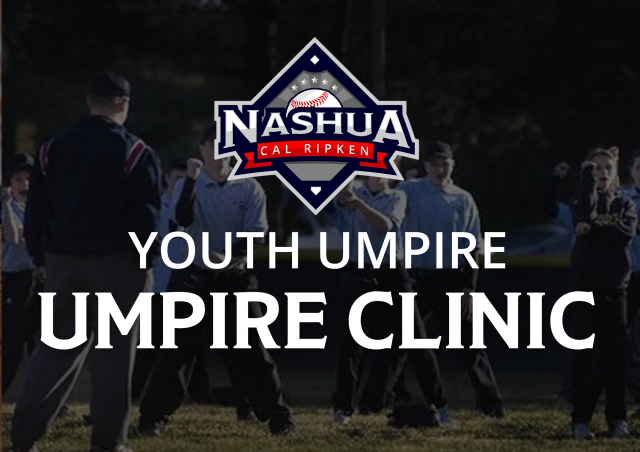 Nashua Cal Ripken will be hosting two Youth Umpire Training Clinics this week. During these clinics, you will learn the basics of umpiring including rules, positioning, conduct, tips and tricks and much more to get you ready for the 2019 season. Nashua Cal Ripken will be holding an Umpire Clinic Tuesday, April 2nd, at 7:00 at the Lake Street Firehouse. This portion of the clinic will be a discussion of the rules. Anyone interested in learning to become an umpire for the AAA or Majors level should attend. On Wednesday, April 3rd, at 7:00 at Nashua Sports Academy (Westwood YMCA), there will be practical instruction. Full umpire gear is required for this event. Upon course completion, Youth Umpires will be incorporated into our 2019 team of umpires that are assigned and paid to officiate games for our mid- to upper- level divisions. Youths interested in AAA umpiring opportunities must be 13 yrs or older. If interested, please arrive at the location and time above with a notebook and pencil ready to learn and take notes. If you cannot attend but are still interested in becoming a Youth Umpire, please contact vp@nashuacalripken.org for more information.